There have been a flurry of posts in discussion lists and online articles recently about a new Google feature called Google Phonebook which will now allow you to do a reverse lookup search on any phone number. The results page displays a cute little phone icon beside the NAME of the owner of any phone number you plug in to Google’s search box! The ADDRESS of the owner of that phone number is displayed beside that and there are links beside the address which will take you to a Yahoo Maps or MapQuest for detailed and accurate driving directions directly to their home! The only way to make that result more invasive would be to include their known email addresses right beside the phone number, street address and driving directions! Fortunately, Google has made it simple to opt-out of this privacy nightmare. and finally a snail mail address to opt out of the listing by postal mail if you like. A popular new book for internet geeks called "GOOGLE HACKS" from O’Reilly offers tips for how to use that feature to refine your search further if you know the state or town of the person you are searching for! When I first discovered this feature, I spoke with a relative whose response was basically, “So what?” All of that information is available in your local phone book and if you don’t have that, you can call information nationwide to ask for the listing. Yes, that should be true, but I searched an unlisted phone number of another relative who was nothing short of horrified when they tried the search on their own number and saw their home address, name and phone number pop up on the Google results page. Not only did her unlisted number show up, but so did her full name, which is not available even to her phone provider – because she uses only initials on her account with them. Clearly these services draw from other available sources. They tell you that they collect reams of information about how you use their site, what sites you visited in their network, any “voluntarily provided information” (which is required to register at the site) and who they share that information with, but provide no published way to remove yourself from their database once you are listed, no matter where they got their information. When doing a search for any number in the “white pages” of Switchboard.com, it returns a page full of banner ads, some pop-up with pre-filled form fields with the name of the person you did a search for! This allows you to easily search for someone who has so far been successful at staying out of the online databases! Those paid services will pry into other public records databases to track them down! CAN I OPT OUT OF PUBLIC RECORDS DATABASES? No. Public records, by law, must be available from the official public records office to anyone who requests them. Accordingly, because individuals cannot opt out of public records databases generally, KnowX.com does not offer individuals the opportunity to opt out of our public records databases. Curiously, that page is only approachable from within their site from a plainly visible “Prices” link but takes you to a log in screen when clicked directly. If you are a fan of pop-ups, you’ll love the KnowX site. I got nine pop-ups while researching this article at their site. Where do all these sites get this information? Few seem to want to discuss where they get it, but one (ATT owned Anywho.com) tells you that their database is NOT populated by extracting information from your long distance billing records. Q: Where does AnyWho get the directory information? A: All of the residential white pages are public information obtained from local telephone records for published telephone listings. Non-Published directory assistance records are not provided and are not displayed. None of the listings contained in the white pages are obtained from AT&T billing records. InfoSpace returns a results page on the reverse phone lookup that not only lists the name and address of the owner of that number, but those dreaded mapquest.com links to driving directions to their home, the average value of a home in their neighborhood, their email address (if Infospace has managed to get your search target to give it to them), lists of names and addresses of NEIGHGBORS, web sites in their listed city or town, and classified ads from local listings. There are dozens more links on the page purporting to be to services in the same town which are actually just links to advertiser sites with ability to search for local dates from Match.com or apartments or restaurants, etc. Fortunately, there is one more very important link on that result page if you want to get your own phone number and personal info removed from their database, labled “update/remove” beside your results that you can click to request that they delete your information. When you do that, they request an email address, so there is some (unearned) trust required in order to ask for removal. This seems reasonable enough since one could otherwise update anyones information. But wait a minute, what’s to stop someone from adding false information, providing their own email address for verification, then answering the email to confirm those changes? At Acxiom, we create and deliver? ?customer and information management solutions? ?that enable many of the largest, most respected companies in the world to build great relationships with their customers. Acxiom achieves this by blending data, technology and services to provide the most advanced customer information infrastructure. That seems like a very long-winded way to say that they too are data aggregators who make a living by selling consumer information to anyone willing to pay for it. Great Relationships? It takes three clicks from their “Privacy” link to get to a page that tells you that it is possible to opt-out. Oh, if only Google were the only privacy concern we had to deal with. It is becoming more difficult by the day to stay out of databases that may soon have more information available in one click than anyone ever thought they needed on you. 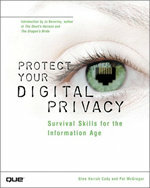 Privacy is becoming a rather quaint notion and, inevitably, unfortunately, may soon disappear entirely. Stalkers, identity theives and marketers have never had it so good when it comes to finding victims, tracking them down and selling them things by phone at dinnertime. That new law puts some teeth into the fight against telemarketers by levying fines of up to $11,000 per violation. Too bad we can’t so easily rid ourselves of the stalkers and identity theives. Mike Banks Valentine is a Search Engine Optimization Specialist and Personal Privacy Advocate Privacy Blog http://RealitySEO.com for businesses seeking visibilty.